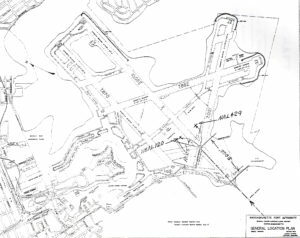 On the evening of November 15, 1961, (about 47 minutes after sunset), two commercial airliners collided on the ground at the intersection of runways 9 and 4R at Boston’s Logan Airport. 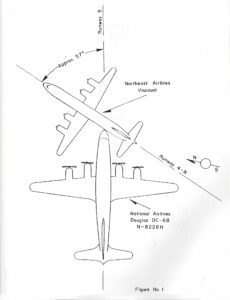 At about 5:09 p.m. National Airlines Flight 429, a DC-6B, (N8228H), was crossing Runway 9 in anticipation of take off when it collided with Northeast Airlines Flight 120, a Vickers Viscount, (N6592C), that had just landed on Runway 4R. After the collision, Flight 120 lurched to the left, went through the runways lights, and came to rest off the runway about 1,000 feet from the intersection. Part of the left wing was severed from the aircraft and although fuel was leaking from ruptured wing tanks there was no fire. Meanwhile, Flight 429 also swerved to the left and came to rest about 150 feet off the runway and 800 feet from the intersection. Despite ruptured fuel lines there was no fire. Although both aircraft were heavily damaged, there were no serious injuries suffered by anyone on either aircraft. Four passengers aboard Flight 120 suffered minor cuts and scrapes while deplaning. Diagram showing both aircraft at rest after collision. Civil Aeronautics Board Aircraft Accident Report.